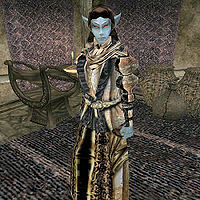 Nevena Ules is a Dunmer noble and one of House Hlaalu's Councilors. She resides in her manor west of Suran. You will need her vote to become Hlaalu Hortator, but she is an open supporter of Orvas Dren, and will not vote without his approval or removal. She is also interested in the location of Vassir-Didanat Ebony Mine, but is distrusted on this issue by her fellow Councilors, Dram Bero and Velanda Omani (and, evidently, even by Crassius Curio, who will point you to the other two Councilors, but not to Ules: all with good reason, as Ules will pay you absolutely nothing if you reveal the location to her). Nevena wears an upper-class outfit befitting of her status, which consists of an exquisite shirt with matching skirt, shoes, amulet, and two rings. She carries a glass dagger, a grand soul gem, and 374 drakes. Aside from her natural resistance to fire and the sanctuary provided by her ancestors, she knows the following spells: Resist Fire, Seryn's Gift, Cure Poison, Balyna's Antidote, and Free Action. "Well, if you've come all this way, I suppose you can ask a few questions." current events: "There's always trouble between outlanders- non-Dunmer Imperial colonists- and the Dunmer natives. Often it just appears to be common theft and crime, but racial and cultural hatreds often lie behind the violence." factions: "Observers of Vvardenfell's politics recognize eleven main factions, some aligned with Imperial interests, some aligned with native Dunmer interests." Great Houses: "Morrowind is dominated by five Great Houses. Three have holdings on Vvardenfell: House Redoran, House Hlaalu, and House Telvanni." Vassir Didanat Mine: "Are you hinting that you know the location of Vassir-Didanat? I promise that you will have great riches if you tell me the location of this mine... Whatever you do, don't speak a word to Dram Bero or Velanda Omani." Tell her the location of Vassir-Didanat: "Yes, I will have someone investigate. I promise you will be richly rewarded." Nevermind: "I am disappointed. I thought you knew where Vassir-Didanat was." "Yes, I promise you will have great riches. These things take time to arrange, [PC Name]." "You should have spoken with me instead. I would have promised you more than just a weapon." "You should have spoken with me instead. I would have promised much more than Velanda Omani." Hlaalu Hortator: Persuade House Hlaalu that you are their Hortator.